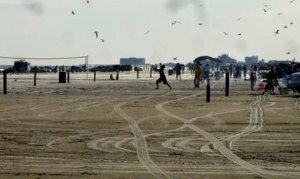 Galveston East Beach or Apffel Park is a smooth sandy Galveston beach. It's best for surfing, fishing swimming and picnic. The beach stretches about a mile and half from the Stewart beach area to the ship channel. Summer time weather can attract a rowdy crowd at the far end near the ship channel but it's less crowded coming toward Stewart beach. One great thing about the beach is the vast sandy shores. I see people sit down in lazy chairs just close to the water bathing in the sun or reading while the gentle wave hits their feet. 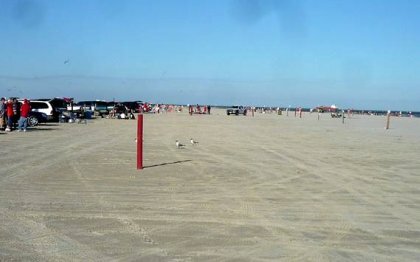 Galveston East Beach (Apffel Park) can accommodate about 7000 vehicles. Visitors coming to Galveston especially summer time will have to see this to believe it. For a public holiday, it will be advisable to stay in any Galveston hotel or Galveston beach rental. Life guards and security are available at the Apffel beach on Memorial weekend to Labor Day weekend. Bring along fishing gear because there are some good fishing areas around here. Some areas are designated for swimming. Some other areas like the the ship channel zone are considered dangerous for swimming. It is recommended to swim in areas protected by lifeguards. Umbrella, chair, boogie board and beach wheel chairs are available for rental here. Parking is available for $8.00 and free parking is available outside the park. There is a $16.00 charge for RV''s buses and oversize vehicles. It's always helpful to pay close attention to the rules of the beach. The nearest moderate hotels are La Quinta inn Galveston, Holiday inn Galveston and Comfort Inn Galveston on the seawall. Also the Marios restaurant, Chilis, Wings and McDonalds are about a mile and half away. That's just a few minutes away so that's good for vacationers. After all most attraction sites are 10-20 minute drive from hotels. Directions from Houston to Galveston East Beach: Come on Interstate 45 South to Galveston Causeway. Interstate 45 changes to Broadway. Continue on Broadway to Seawall Boulevard. Turn left onto Seawall. Go on Seawall until it ends. Make a right on Boddeker Drive and Follow the signs to East Beach!